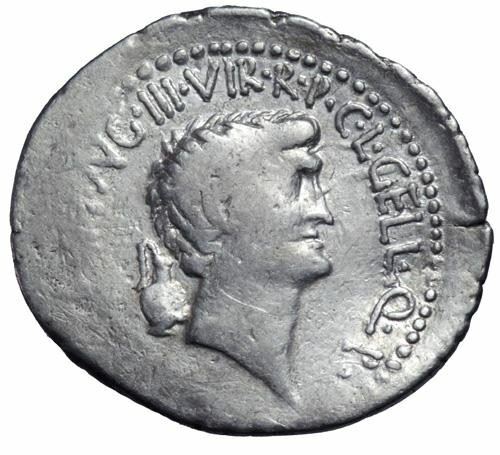 Lucius Gellius Publicola struck coins in 41 BC, jointly with Marcus Antonius and a number of other people. Gens Gellia was a plebeian family at ancient Rome, where they settled after the Second Punic War. The first of the Gellii to obtain the consulship was Lucius Gellius Poplicola, consul in 72 BC, but the most famous member of this gens is probably the grammarian Aulus Gellius, who flourished during the second century AD. The Gellii were of Samnite origin, and the first of this name occurring in history was the general Statius Gellius, who was captured together with his army in 305 BC, during the Second Samnite War. Another general of the name, Gellius Egnatius, fought against Rome during the Third Samnite War. The family does not appear to have reached Rome before the end of the Second Punic War, but probably arrived soon afterward. The earliest known Gellius at Rome was Gnaeus Gellius, the accuser of Lucius Turius, who was defended by Cato the Elder. During the Republic, the only cognomina used by the Gellii were Canus and Poplicola or Publicola. The former surname means "white" or "light grey", while the latter means "one who courts the people."